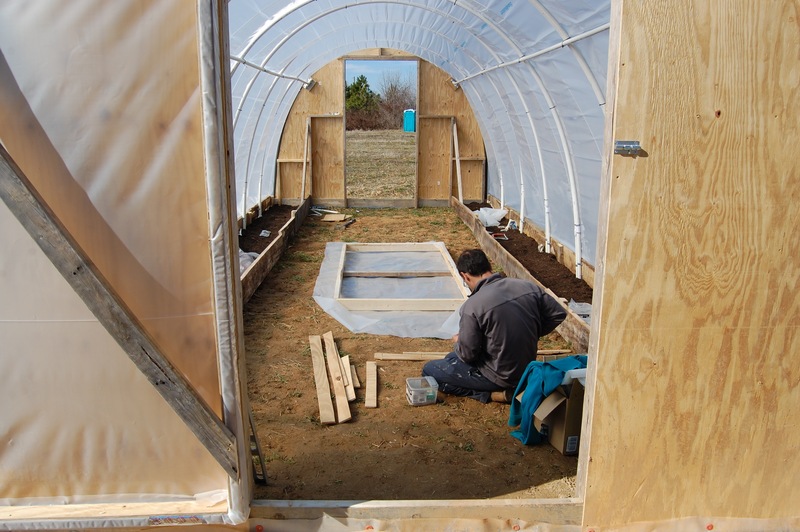 We have taken a short break from the house this month to build a small hoop house for ourselves. The main purpose of this 12×28 structure is to give us a place to start seedlings for the farm. However, we also built two 2-foot wide raised beds to grow winter vegetables for us to eat. We drew a lot of our design from Alberta Home Gardening (1, 2), but made a few changes. The main change was to build each hoop out of a single piece of PVC, since the hoop house we were borrowing last year broke at the joints. We tried building a caterpillar tunnel without any joints. If the first version of the PVC caterpillar looks too weak, well, it was. The day after we finished we had a wind storm with gusts between 40-50mph and two of the hoops broke. We doubled the hoops and added purlins. 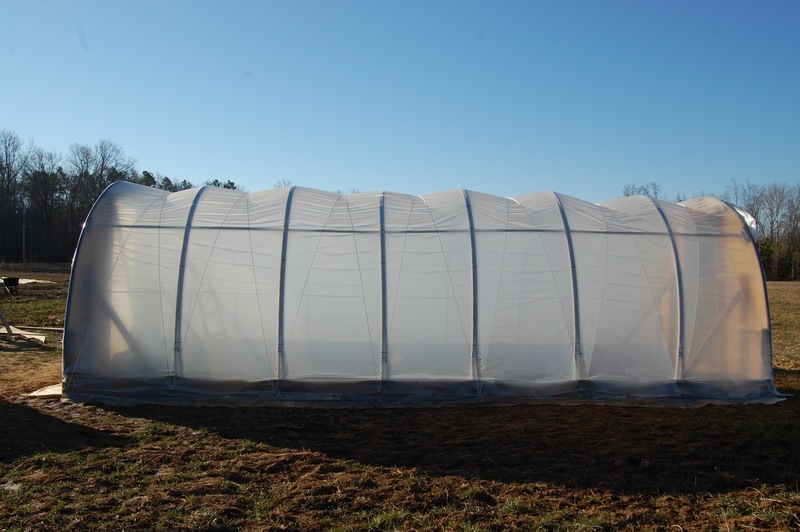 We’ve had windy days since then and the reinforced hoop house stood up just fine. That was a HUGE relief. Here are step-by-step photos in case you want to build something like this. 1) We laid out the edge of the beds, staked them down, and put in rebar to slip the PVC over. 2) We put a 2-foot leg on each end of each hoop to give us more growing room at the edges, then put the hoop over the rebar and used metal straps to attach the hoop to the frame. (We didn’t want a joint at the top where it would be weak, but there is a lot less stress on the joints at the sides.) Each hoop is made of a 20-ft section of 1″ PVC. 3) Designing the end walls was a challenge for us. We based the end wall design on the design from Alberta Home Gardening (1, 2) and we are pleased with how sturdy the end wall is. The solid end wall does cast shade, so we’ll have to see if that is a problem or not. We used a hoop to trace the shape onto the plywood and used pipe insulation on the edges of the wood to protect the plastic. 4) We bought energy-efficient IR/AC (Infrared/Anti-Condensation) plastic from Farm Tek. The IR/AC plastic is only marginally more expensive than standard plastic and can have a big impact. It was breezy, almost too much to get the plastic on, but we did. We attached the plastic to the end walls using plywood laths. 5) We created the “caterpillar” by pulling 3/16″ polyester rope back and forth in an “X” pattern. It took two ropes, each running the length of the hoop house. We used eye bolts at each hoop to pull the rope through. So here is Version 1 of our hoop house. It may not have been strong enough, but dang, the caterpillar tunnels look neat and nice. Sadly, it wasn’t rigid enough. With 40-50mpg gusts of wind, the hoops bent all the way down to the ground and broke where they were strapped to the frame. 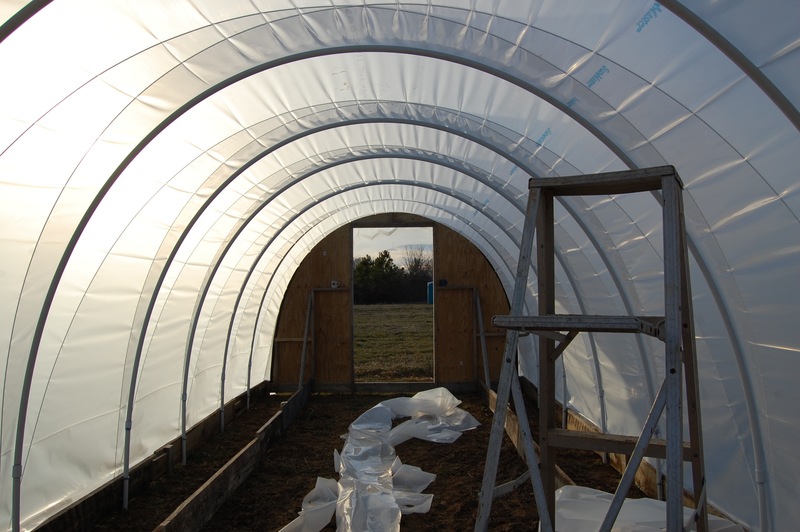 Lesson Learned: A much more rigid, stronger material is needed for a caterpillar-style hoop house without any purlins connecting the hoops. 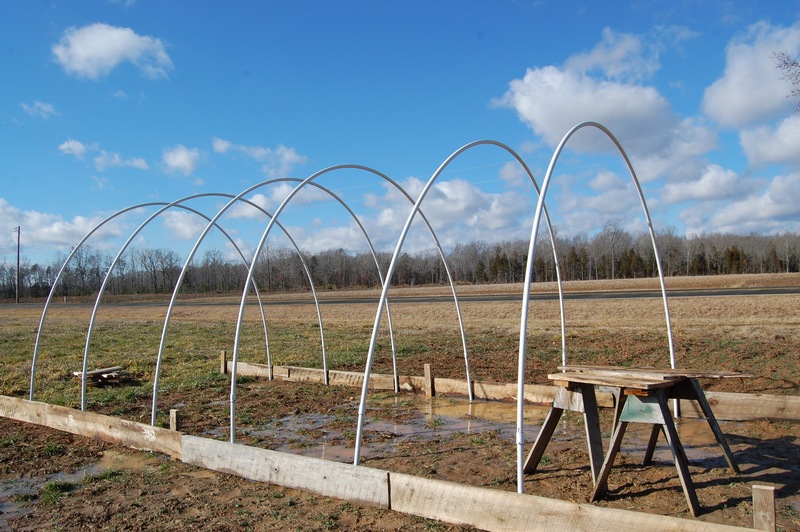 6) In order to reinforce the hoop house we added two purlins running the length of the hoop house. We also doubled up every hoop. (We’re not sure if the purlins would have been enough on their own, but we couldn’t take any risks with the wind wreaking more havoc.) We added rebar for the extra hoops and connected each hoop pair with several zip ties. The purlins end in Ts which are strapped to the end walls. The purlins are attached to the hoops with 2″ drywall screws and zip ties. 7) We built doors out of simple frames and ends of plastic. 8) Once the doors were on, we began filling the beds. The beds were sheet mulched with cardboard and newspaper, then filled with layers of leaf mold, top soil, and compost. Mr. Bingley loved having piles of earthy black piles lying around the farm in the winter sun. Now the hoop house is finished. It has survived strong winds at least once since we reinforced it and done well. We will build tables and a heat mat to start our seedlings (we’ll post about that soon). For now, we are excited to have completed this, look forward to starting a bounty of spring flowers and veggies, and can’t wait to eat out of our two new beds, and are eager to get back to working on our house. Previous Our Roof is On! Thank you, Paul. We hope your house construction is going well. If you’d like to visit the farm (and house), we’d love to have you out later in the season when things are in bloom. Nicely documented you all! This could appear in a gardening or farming magazine–why don’t you submit it? Interesting to see the lesson learned in your experience, and how you were able to make a smart adjustment to fix the problem of weakness. GREAT step by step. We just lost our hoop house today with 40 mph gusts of wind 😦 So I had to roll it back to the ground and so I am looking at different ways to hold the film down. One question on yours. 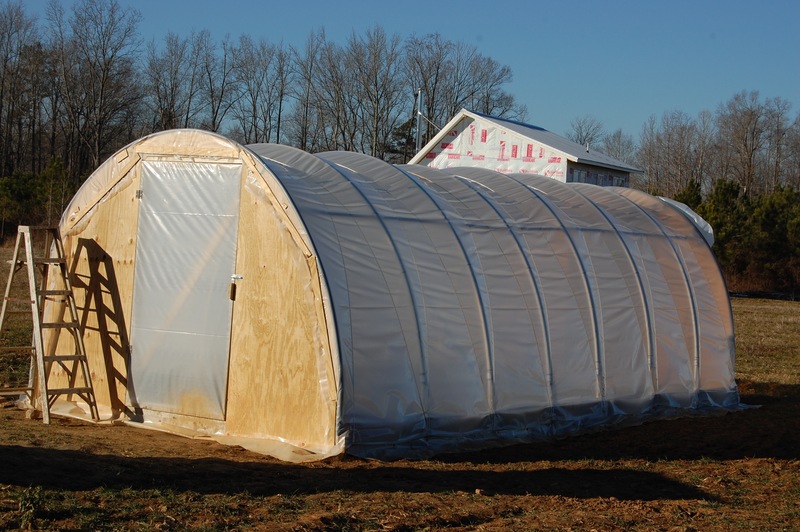 What do you do about venting the hoop house when it gets too hot? We had only a little bit of sun yesterday i the afternoon and it registered 94º inside the hoop house and it was only in the 50sº outside at the time. When we start to get in the 70s it’s gonna be REALLY hot in there and so I’m concerned that I won’t be able to lift the sides to allow the heat out. We vent ours in a couple ways–we open doors on both sides and, if it is really warm, we pull the sides up. We use small loops of string with a large knot to grap our rope from behind and create tension that holds the plastic up. 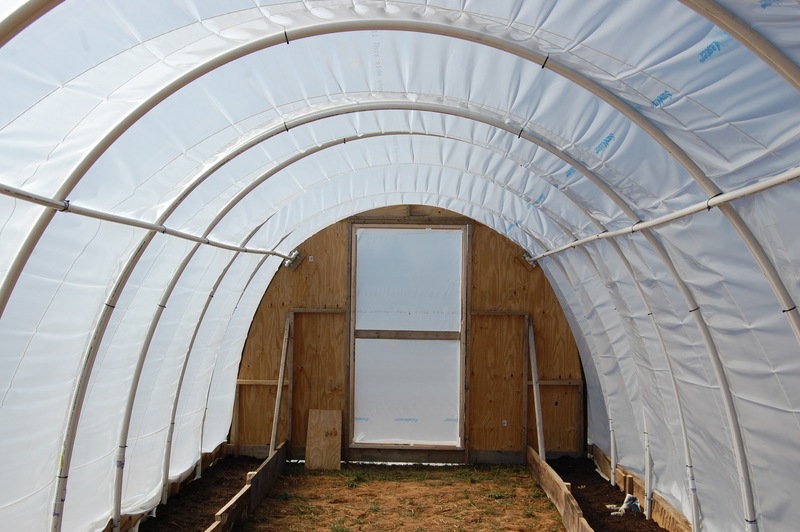 However, I would not actually recommend copying our hoop house design. It was an experiment and we would rebuild it differently. 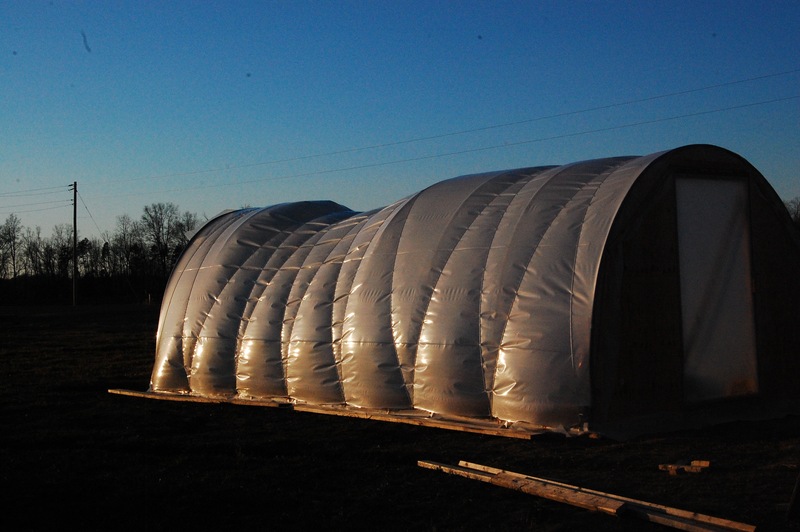 Instead of the hybrid caterpillar design I recommend traditional end walls and methods for attaching the plastic. Then I would use the traditional wood purlins and just roll the side walls up. With our hybrid design the caterpillar rope pulls the whole structure in with nothing to counteract that force, as with the typical caterpillar design with the plastic extending past the end and tied to the ground. As a result our end walls are being pulled inward and the doors aren’t closing well. Our hoop and rafter structure is sound, I think, and could be replicated for a better design for managing the plastic. Thanks of the fast reply and the info. I thought you had attached the sides to the boards at the bottom. So it sounds like the zig zag rope keeps the film on without having to attach it. 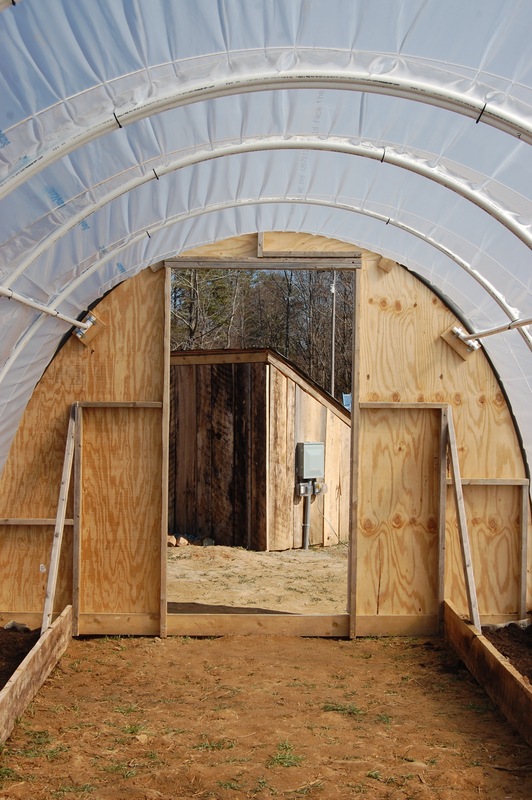 The hoop house we have put together so far is made from 1/2″ rebar. We welded an additional 4′ to a 20′ piece and when arched at 11′ gives us a 7′ peak. But the issue is as you said there’s nothing pulling the whole thing forward and keeping it stretched out. We used bail twine as the purlins on the sides and top hoping that the whole thing would have to move as one. But it didn’t work at all. Like you said, it needs to be rigid. I was hoping to not have to build anything that would be permanent, or least as much so that it’s a pain to take apart, as this was going to be an experiment. These photos might make more sense than my explanations. Follow the links. We installed two pvc ‘rafters’ which I think really help,with structural stability. I bet you could do something similar in metal. Here are photos of the rope loops we use to pinch the ropes to put tension on the plastic. Yeah it is. The cross pieces you use WOULD give more stability The side Purlins I installed are too low to put them across that way. I started building out the end today. I don’t see anywhere in your article or the Alberta Home Gardening article of how you connected the end to the last rib of the hoop house? So how did you guys do that. And did you anchor the end at the bottom or did you just use the two 2x4s into the side of the beds as I can see in the picture? Rex, the end is anchored with 2×4 stakes pounded into the ground. You can see them in the photo of the raised beds before the plastic is on. There is no end hoop. We cut the plywood in a shape to match the hoops, slid pipe insulation over the ends, and pulled the plastic over that.